My Trackbook offers a multilingual platform to share your maps with the world. It's also a site where you can easily find public Google Maps submitted by others. The homepage consists of a global map. You can zoom in on the area of your interest, choose different categories and click on markers to go to the submitted maps that they represent. To submit a map you simply submit the URL of the Google Map or a KML/GPX file. After approval your map will be added to the site and you can submit more maps. 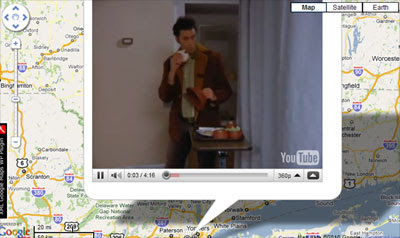 This site is worth checking out if only to watch the embedded videos in the Seinfeld Location and Scenes Map, ("the government has been experimenting with pigmen since the 1950's").